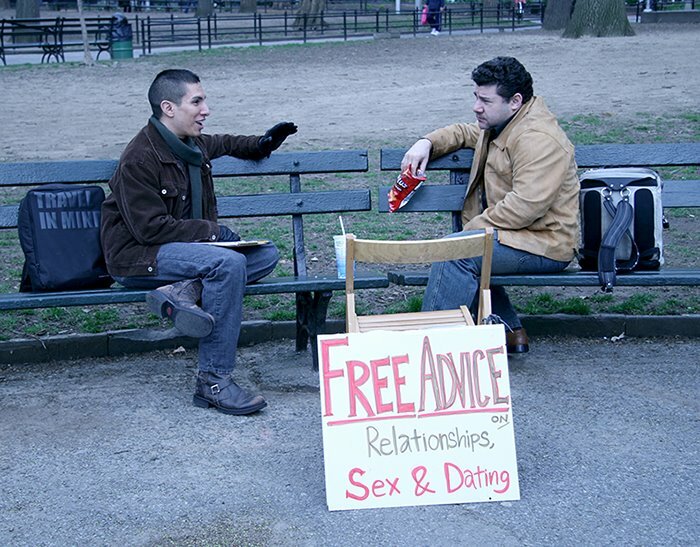 Many years ago I had an idea to sell advice on the streets on New York City for $1. I proposed this to two friends, and they really liked the idea. Both had experience in therapy. We all had diverse backgrounds, strengths - most importantly we felt we also shared a lot of life experience. And it would be fun. I thought it was a novel idea - I was a little disappointed when I found out that three women had done it years before and had written a book about it. Amy Alkon, Marlowe Minnic, and Caroline Johnson were three ad agency people who started giving free advice on the streets of SOHO in 1988 and published a book - Free Advice in 1996. We plied our trade a few times. It was a lot of fun - we wanted to do more but never did. So when a friend and I were strolling through the park and came across this fellow, I was quite startled to see him doing the same thing. For free. Now when I did this with my two friends, we had long discussions about charging money or doing it for free. Our feelings were that people take things more seriously when they have to pay for it - it's about commitment. And the seller takes it more seriously too - we did. The dollar transaction made a difference. We only did it a few times and planned to again but never did.